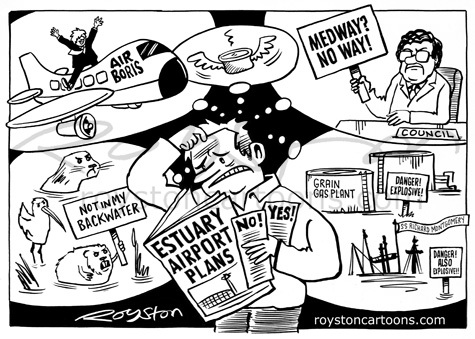 I was commissioned to draw a humorous illustration for a newpaper supplement on the proposed Estuary airport in Kent. The idea was to reflect the different arguments and points of view that residents are having to deal with. Represented are: Boris Johnson, Mayor of London as the pro lobby (the plan has been dubbed Boris Island); the anti-airport Medway council leader; environmentalists' concerns about the threat to rare wildlife; and the slightly worrying close proximity of an old gas plant and a sunken ship full of explosives! Whatever happens, we can only hope that the wishes of residents are not treated with contempt, as is so often the case. See You've Been Trumped, a highly recommended documentary, which I saw last week. Seek it out, but be warned: it will make you angry.